Particularly suited to spa therapies! Merrill Collins is a composer, keyboardist, producer and publisher who holds both bachelor’s and master’s degrees in music. 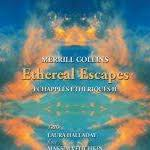 On her latest album, Ethereal Escapes: Echappées Ethériques II (a sequel to Echappées Ethériques), Collins plays grand piano throughout where she is once again joined by Laura Halladay on flute and Maksim Velichkin on cello. Combining classical music with contemporary improvisation, the trio musically interact with each other as if having a dialogue among sixteen compositions of which span an exact total of sixty minutes. “The Fountain of Jewels Activated” beautifully introduces the album with an improvised ensemble of cello, flute and piano, accentuated in parts by glistening chimes that recall a stream of running water. Laced with elements of the Far East, the piece sets the mood for the rest of the album, effectively conveying the aromatic and tranquil atmosphere of an oriental spa. One of my favorite pieces is “Listing with Our Ancestors”, which begins on a more solemn note with distinctive, billowing cello and piano in the lower registers. Airy flute hovers above like leaves dancing in the wind, as piano eases into the midrange where it ebbs and flows like a river, as if providing an elemental link to the comparatively earthier cello in what could be likened to the Celtic triplicity of land, sea and sky. Another highlight is “We Heard Earth Weeping”, which opens with the reverberating sound of a gong swirling amidst somber cello notes. Piano and flute join along in a gentle melody for a while, finally concluding with the return of the gong, its deeply echoing resonance perhaps signifying a grounding connection to the earth. I’m also particularly fond of “Living in Harmonious Worlds”, which boasts one of the most elegant and classically refined melodies herein as it imparts gently fluttering bursts of piano throughout its course. Concluding the album is “Triumphant Upon Arrival”, which initially begins with amelodic and minimal textures. Colorfully unfolding into a gently melodic ensemble, the piece effectively evokes images of a paradisal garden located somewhere in the Far East. Particularly suited to spa therapies and the like, the talented trio have presented an enchantingly elegant interweaving of new age, neoclassical and East Asian musical influences on this latest offering. Often seemingly evocative of the earth’s elements, Ethereal Escapes is an album that beautifully demonstrates a refined yet regal sense of nature’s beauty, reflection and solitude!